Beach Polo World Cup, the world’s largest Beach Polo tournament, is making its official return to the sands of South Beach. From January 4th to January 7th, polo enthusiasts will gather at W South Beach to witness the resurgence of the world class polo extravaganza. The four-day event is poised to be bigger and better than ever, with a brand-new layout, some of the best players and unprecedented daily activations. The weekend will be filled with three amazing days of polo matches that will commence on Friday morning. Six competing teams comprised of some of the world’s top players, including Nic Roldan, Ricardo Mansur, Nacho Gonzales and Juan Bollini, will be competing throughout the weekend for Beach Polo World Cup. The tournament will also host a women’s cup on Saturday featuring two female teams along with a charity match on Sunday supporting Beach Polo’s official charity partner, The Bass Museum. “We couldn’t be more excited to bring Beach Polo World Cup back to the sands of Miami Beach. We have been working tirelessly for over 5 years to bring this event back in its proper form, as one of the world’s elite polo events, taking place in the city we love to call home” – Tito Gaudenzi, Founder of Beach Polo and President of Lifestyle Companies. The traditional post-event awards ceremony will be held at the end of Sunday’s last match to commemorate both women’s and men’s competition winners, during which sponsor representatives will present trophies to the men’s and women’s finalists. This year’s Beach Polo World Cup is sponsored by David Yurman, La Martina, Douglas Elliman South Florida, Karma Automotive, Macallan, Chateau d’Esclan, Mumm Champagne, Grand Champions Polo Club amongst many more. “We are looking forward to making Beach Polo a premier annual event in South Florida. The weekend will mix the greatest polo players and some of the world’s most recognizable brands for an unforgettable experience” – Melissa Ganzi, Co-Founder of Beach Polo World Cup. 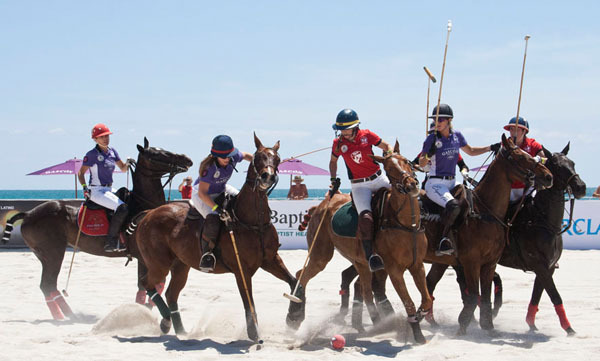 In addition to the matches, Beach Polo World Cup aims to become one of Miami’s signature lifestyle events. The weekend will include a series of nightly activations such as the Bal Harbour Village kick off, and Polo Player Nights Out at ORA Miami and WALL Lounge at W South Beach. General admission to both competitions and the adjacent Retail Village is complimentary, and concessions will be available to purchase. To commemorate Beach Polo, La Martina will be creating a limited-edition Beach Polo clothing line that will be on-sale at the La Martina retail tent on-site throughout the three days of matches and at the La Martina store in Aventura Mall. The VIP tent will be invite only. VIP tickets allow entrance to the shaded Grandstand, where free food and drinks will be served. For event updates, announcements and more information about Beach Polo World Cup, visit www.miamipolocup.com. PreviousPrevious post:NY BOTANICAL GARDEN WINTER WONDERLAND BALLNextNext post:ELEVATE YOUR FOOD EXPERIENCE IN L.A.